The company commenced an 8,600m reverse circulation (RC) exploration drilling program on August 13, at Angularli and Such Wow in Australia. Vimy Resources (ASX:VMY) has released an update on its activities at the Alligator River project located in Australia’s Northern Territory. The company commenced an 8,600m reverse circulation (RC) exploration drilling program on August 13, at Angularli and Such Wow. Both of the prospects are situated in the King River-Wellington Range tenement blocks and are part of a joint venture. During the current field season, drilling is focused on two outcomes. Firstly, to extend areas of known mineralisation at Angularli, both along strike of, and parallel to, the current resource, which stands at 0.91Mt at 1.3 percent U3O8 for 26 Mlbs (Vimy 75 percent). This program comprises fourteen holes for 4,650m. The second drill program is at Such Wow, 15km south-southwest of Angularli. This prospect has not been drilled previously, however it is highly prospective for ‘Angularli-like’ deposits based on Vimy’s assessment of surface sampling, and mapping of geology, alteration, and structures. This program comprises 15 holes for 3,950m. Other planned field work includes surface geochemical sampling, mapping, rock-chip sampling, and passive seismic data collection. Part of this program is being done across the Angularli area to provide baseline data for other future surveys. “This is our first exploration season at the Alligator River Project. What makes this project really exciting is the strong similarity between the geology of Alligator River and the Athabasca Basin in Canada. The key to exploration success is the presence of an important rock unit called the Cahill Formation which hosts both the Jabiluka and Ranger deposits, which are absolutely world class. 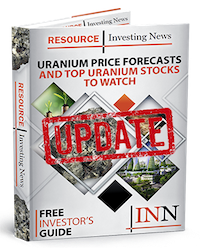 The Cahill Formation is the ‘Golden Mile Dolerite’ of uranium,” said Mike Young, CEO of Vimy Resources.